Panoramic head, quick release plate (12*8cm) with 1/4 & 3/8 inch screw. 4 Degrees of photographic freedom: Ultra-Smooth Pan, Tilt for perfect panoramas, Elevation with geared swing-away knob, 90 degree Pivot Head. Panoramic head, quick release plate (12*8cm) with 1/4″ & 3/8″ screw. 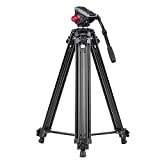 This entry was posted in Discount Photography and tagged 10KG, Alloy, Aluminum, Andoer®, Ballhead, Camera, Canon, DSLR, Fluid, Head, Height, Hydraulic, Inches, Load, Nikon, Panorama, Professional, Recorder, Sony, Tripod, Video by Ball Photo. Bookmark the permalink.